We must, mustn’t we~~said she heatedly!! !~~moreover, she was adamant that I must become personally involved in the investigation~obstensibly because the more the hens who coo, scratch and cackle in the estate fourth, the nearer we are, dear–to~~ what exactly~~~a resolution, dear?? As a nationally syndicated columnist and book author, he famously spoke out against Christian Science, social stigma, fakery, Christian radicalism, religious belief (and as a fervent nonbeliever, against the very notion of a deity), osteopathy, antievolutionism, chiropractic, and the “Booboisie”, his word for the ignorant middle classes. In 1926, he deliberately had himself arrested for selling an issue of The American Mercury that was banned in Boston under the Comstock laws. Mencken heaped scorn not only on the public officials he disliked, but also on the contemporary state of American elective politics itself. In 1931 the Arkansas legislature passed a motion to pray for Mencken’s soul after he had called the state the “apex of moronia”. 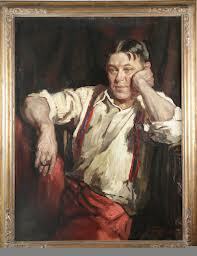 Mr. Mencken was German, drank, and was from Baltimore~~so, we must make substantial allowances on all those counts ~~for his behaviour and opinions. ~~~there is something in that, Henry Louis, yes, Sir, there is. 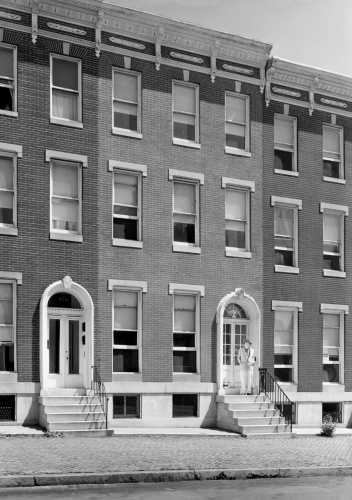 H. L. Mencken’s brother, August, stands in front of the Mencken house at 1524 Hollins Street, Baltimore. Henry Louis, universal disparager, of all Heavenly Gods and Earthly Political Tin Gods, was cute and all, but where, I wonder, did he end up after he’d downed his last, long glass…. Mencken is fictionalized in the play Inherit the Wind as the cynical sarcastic atheist E.K. 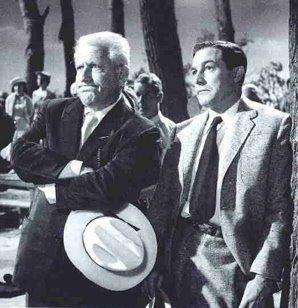 Hornbeck (right), seen here as played by Gene Kelly in the Hollywood film version. On the left is Henry Drummond, based onClarence Darrow and portrayed by Spencer Tracy. Henry Louis, for your sake, I hope Jesus is a German from Baltimore who likes his glass and has a sense of humour. Yes, yes–but did you read my article about Picasso yesterday dear and the others Jeff turns out day and night–he sure misses hearing your sweet voice.